Although we men don't go around hunting things with sharp sticks anymore, the desire to cook and char flesh over the lapping flame seems as much an innate part of ourselves as leaving the toilet seat up. It is, perhaps, an embrace of the primitive: a fulfillment of our basest, caveman instincts in wanting to see the fruits of the kill sizzle and sputter before we eat it. I came to this conclusion after thinking about the last two dining outings with guy friends. Both have involved fire and meat. On these two separate occasions, with two separate groups of two different sets of males, we all collectively came up with the same, unanimous decision: we were going to have Korean BBQ. No one objected or proclaimed they were on a diet. Salad eaters? If there were any among us, they did not identify themselves. Everyone gobbled up just as much meat as the next guy. Bleching was not looked down upon. And with one group of buddies, every meet up since last year has been at Shik Do Rak, a Korean BBQ in Irvine. It was here that my mates and I slapped fatty cuts of pig and cattle to brown over searing metal. Partially frozen and bloody slabs of steak and pork belly became hot, juice-dripping, charred swatches of goodness that we'd wrap around rice noodle squares and dunk in salted sesame oil. 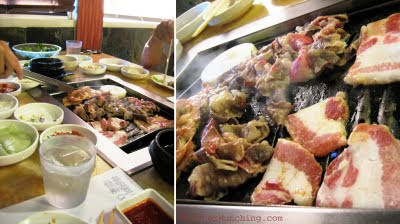 But sensing a rut, I did what a good friend would do: for our next outing, I suggested Cham Sut Gol, a highly lauded Korean BBQ in Garden Grove. It would not only satisfy our requirement for fire and meat, but also fulfill another male-only predilection: to consume more food than one's stomach can conceivably hold. Cham Sut Gol is an all-you-can-eat for one fixed price of $16.99. Not only that: it is an AYCE from which you don't have to get up from your seat. Simply ask and they'll bring you more. While my fellow meat-eaters flipped chicken, pork belly, and beef on the hot grates, I was preoccupied with the panchan. Though always customary, Cham Sut Gol's selection looked to be more immaculate and complete than most. Though I am not saying you should, you could make a complete meal of these sides alone. The cooly refreshing potato salad was creamy without being rich, perhaps the best I've ever tasted. The chap chae noodles wiggled as I slurped. But what I liked most was the fluffy, airy, and savory egg custard served in the metal pot it's cooked in -- it comes free as part of the meal. At the end of the night, I ate far too much, swigged more soju than I've ever drank to dissipate the accumulated meat grease, and had a great time communing with comrades. But my mates told me something that shattered my assumption that we were just Neanderthals with indiscriminate tastebuds and bottomless stomachs: they preferred our old haunt, Shik Do Rak, eventhough it wasn't an AYCE. The meat's better there, they said. Dude! Way to get all civilized. 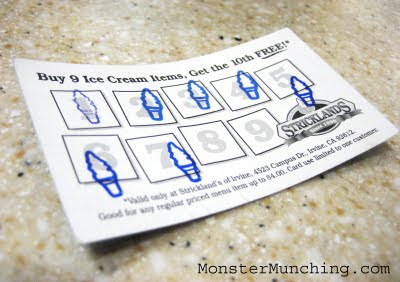 My first summer job as a teen was at an ice cream and sandwich shop in Fullerton. They didn't let me handle the deep fryer or the burger grill. And apparently, my arms were too scrawny to scoop ice cream. I was, instead, put in charge of the sandwich station, which in retrospect, was probably the most important job there. Think about it: the burger guy made only one type of sandwich. But me? I was responsible for more than half the menu. Different breads, meats from three distinct species of animal -- not counting tuna and egg salad. I had in my repertoire at least four kinds of cheeses, vegetables, sauces, a toaster, a microwave, and a big honking, serrated knife to cut my finished masterpieces in half before serving. Though seemingly simple, I'd argue that proper sandwich assembly is a craft. It's perhaps not as difficult as smithing, but the results are usually more delicious. And I'm not the only one to think so. Alton Brown once said: "to some it’s a couple of pieces of bread with something shoved between. To others, a sandwich is a sublime balance of flavor and texture born as much of technique as ingredient." Sheldon Cooper, from The Big Bang Theory (my favorite sitcom at the moment), would also agree with this assessment. If I had it under my authority to award Emmys, I would give it to that show (did I mention it's my favorite? 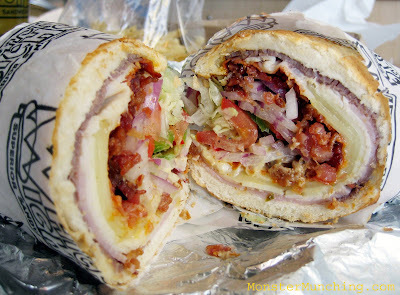 ); but if there were a prize for the craft of sandwich assembly, I would bequeath it to whoever made my sandwich at Which Wich in Santa Ana, the only branch in Orange County of a nationwide chain that looks poised to take a piece of the loaf away from Subway and Quiznos. In my opinion, and judging by the sandwich I had, Subway and Quiznos ain't got nothin' on it. My sandwich, called "The Wicked' was perfectly put-together from good quality components, and, this part is most important: encased in a hollowed out, crunchy French loaf with a crust that crackled like the best Little Saigon banh mi baguette. Being a fan of the Vietnamese sandwich, Which Wich's already impressed with the bread. But "The Wicked" also contained five meats. Yes. Count 'em: FIVE. With turkey, ham, roast beef, pepperoni and bacon, it's like a club sandwich with a few extra members. And three of them are from that most wonderful, magical animal: the pig. But first, about the place. 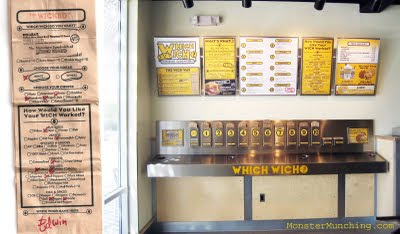 Which Wich has an efficient and ingenious ordering system and a list of 50 sandwiches in all. Some of the notables include a SPAM sandwich, a Cuban, a Monte Cristo, and even an "Elvis Wich", with peanut butter, honey and banana. When you decide what type of sandwich you want, (even if you order "The Wicked" like I did) you are instructed to take a brown paper bag from a receptacle labeled with the type of sandwich you chose. Then, on the bag, you mark off your bread, cheese, veggies, sauce, and spicing preferences with a red Sharpie. Finally, you scribble your name and pay the flat price of $5.25 ($6.25 for "The Wicked"). With "The Wicked", the extra dollar also entitles you to three cheeses. From a list of seven, I opted for Swiss, Provolone, and Pepper Jack. As I filled in my choices, I thought to myself, "What the hell am I doing? I already have five kinds of meat. Do I really need three kinds of cheeses?" 1) I am an American (already pudgy). 2) I am an Asian (I paid for it, damn it). Next were my mustard and mayo options. I got culinarily wise and chose the Dijon mustard and the horseradish mayonnaise to cut through the layers of protein and cheese. I could've opted to do the fat free mayo, but hypocrisy does not belong in a sandwich. A few minutes after I handed my order to the cashier, the finished product was bagged in the same sack I marked up. See, didn't I say the ordering system was genius? But the real achievement is the resulting sandwich itself. Like an architect conceptualizing the rambling requests of a madman, the sandwich maker constructed from my scribbles a sandwich worthy of I.M. Pei, or his sandwich-making equivalent. The cross section cut above shows it in all its glory: the veggies are strategically centered in the middle so as not to dampen the precious crispness of the bread, which is further protected by layered rings of the meats and cheeses. In every bite, the sauces intermingled, asserting itself through the sweet and porky clout. This was a better class of sandwich made by a better class of sandwich maker than I ever was or could be. Name me a culture, and I'll show you a shaved ice dessert from it. Mexicans have raspado. Hawaiians have shave ice. Koreans have patbingsu. Indonesians have es cendol (and others). 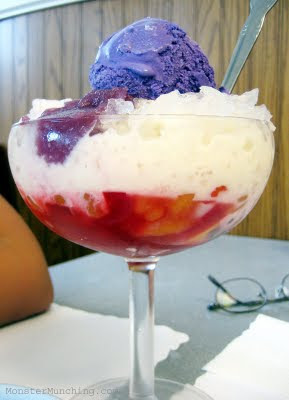 All will function as coolant for your overheating head, but I would argue that the Filipino version, called halo halo *, has more going on than most. If a snow cone is the basic factory model, Magic Wok's special halo halo ($3.99) is a feature-ladened, pimped-out ride, complete with free-rotating hub caps and ghetto blasters. I'll begin with what you see first: the ube ice cream. Ube is an obscenely purple yam. And I mean it when I say it is purple. The color exists at a wavelength that should not exist in nature. Think of the Joker's suit and then turn up the crazy. That's how purple ube is. Below it: ice. Not shaved, but sort of crushed to the halfway point between snow and hail. The crystals are crunchy but not solid, whose main function is to slowly melt and cool down every inch of your sundae glass and your mouth. You begin by nibbling on the ice cream, but you don't have to be coy. You can choose to attack it and submerge the scoop until it gets worked into the slurry. 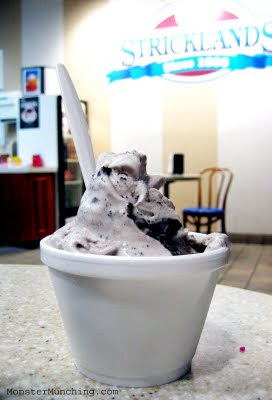 The ice cream run-off just makes the dessert what it is: a refreshing, milky potpourri of chill. On the bottom, there's a Technicolor mish mash of ingredients just waiting to be unearthed. Bits of jackfruit, Jell-O-like cubes of agar agar, sugary red beans, custardy flan and more. Tying it all together: drizzles upon drizzles of sweetened condensed milk and syrup. All yearn to get down and funky with each other. So stir it up! Get the party started! Near the end, your glass will not look anything like what you started with. Like the aftermath of a rave, the neatly divided strata gets tossed up and swirled up in its icy mosh pit. But your headache won't be from a nightclub hangover; it will be from brain freeze. 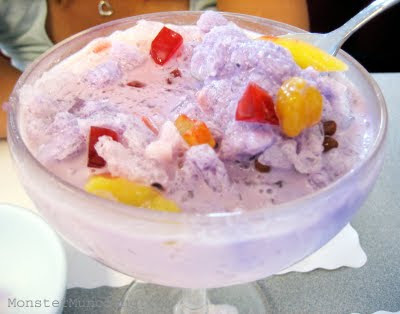 *Tip for non-Tagalog speakers: When ordering, keep in mind that "halo halo" rhymes with "shallow". Pronounce it like the Xbox video game and risk embarrassment! 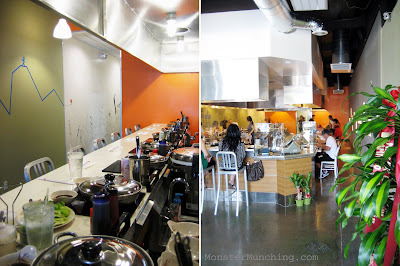 **Special Thanks to Wandering Chopsticks for her counsel on Little Saigon's regional offerings. Timely. That's me. Last week I reviewed a restaurant that closed for good the day before I wrote about it. 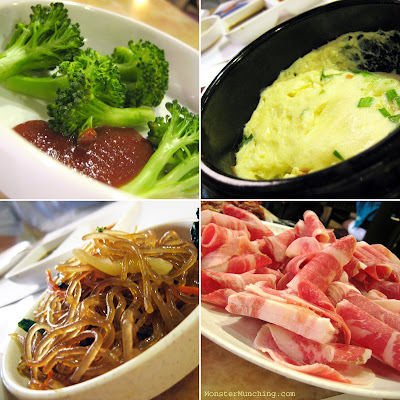 This week, I went to a shabu shabu restaurant in the thick heat of August. A few seconds outside induces instant flop sweat, and here I am, eating from a boiling pot inches away from my face. Coincidentally, the last shabu shabu meal I had was around this time last year. The weather was just as scorching then as it is now. Either I'm a proverbial glutton for punishment, or just prone to predictable patterns of behavior. This year's unseasonal craving took me to the new outpost of California Shabu Shabu in Costa Mesa, which recently opened after a year of delays and hilarious misunderstandings with the Costa Mesa Police Department. 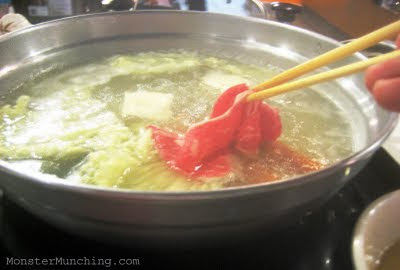 But surprisingly, I wasn't the only one who thought eating shabu shabu in summer was a good idea. It was past 1 p.m. on a Sunday, yet every seat was occupied (picture below was taken minutes before a large crowd arrived). 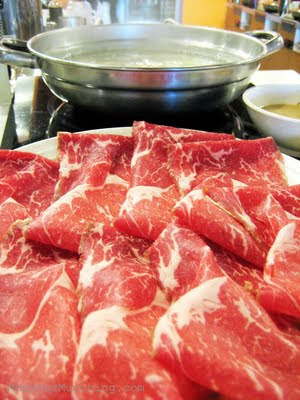 Each diner sat facing gurgling cooking vessels, swishing thin slices of meat in steaming liquid, and slurping hot soup. Looking around the room, it also occurred to me that no one seemed to be over thirty. Most of the customers were at that enviable age when incomes are disposable and the world's frivolous pleasures are a credit card swipe away. Ah, to be in that sweet-spot between college and real life; a time when you are responsible for nothing but yourself. 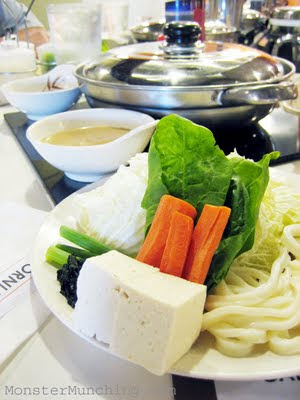 Other folks with oppressive mortgages, kids to feed, or are otherwise resistant to paying any amount of money for a lunch that you have to cook yourself, would be less keen on what California Shabu Shabu, and other restaurants of its ilk, has to offer. The lunch prices hover in the ten to twelve dollar range for a standard plate of tissue-thin raw meat. More if you opt for more premium cuts. The Kobe beef breaks the bank and gets the creditors calling. There's no need for the fancy stuff anyway; all grades of beef are well-marbled and designed so that each slice disintegrates into a mouthful of beefy tenderness. Surprisingly, I was stuck on California Shabu Shabu's rice. It's fluffy, perfectly cooked, and fragrant -- ideal for sopping up the sauce that dribbles from the boiled meats after it soaks in ponzu. And somewhere during the cooking process, Leonard, the young owner and his equally young staff, goes around the room with an eye dropper containing some sort of concentrated capsicum extract. I asked how hot it was and our female server said "not very". So I requested for three minuscule drops to be dripped into my ponzu sauce. I swirled around a piece of meat in the slurry, ate it, and almost immediately, my whole head started gushing sweat from every pore. My hands tried to vainly fan out the fire that now burned white-hot in every millimeter of my mouth. I looked like a panting dog. Seeing I was in pain, Leonard gave me a new bowl of ponzu. At the end of the meal, they offered everyone a spoonful of soup base to flavorize* the cooking broth. It's for making noodle soup, you see. Normally, at other shabu shabu joints, I make do with some improvised combo of soy sauce, garlic and vinegar. This was a nice gesture. But as I ladled the roiling soup into my bowl and took my first scalding sip, I realized that it was still friggin' summer outside. Check back here same time next year for my next shabu shabu outing. *Not a real word, but I'm using it anyway.